Battaglia was traded from the Hurricanes in 2003 and is currently playing for the Maple Leafs. Despite being so far removed, he still calls Raleigh home. Bates Battaglia and Sam Malone would make friends quickly if television fused with real life. 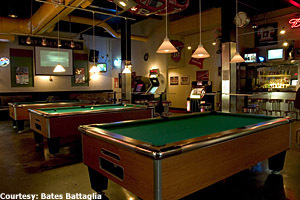 Battaglia is a left wing on the Toronto Maple Leafs and owner of Lucky B’s Around the Corner, a tavern in Raleigh, North Carolina. Malone, the retired Boston Red Sox pitcher, of course, was portrayed by Ted Danson in the hit TV series Cheers. Though Cheers is indeed a real establishment in Boston, the character of Sam Malone will only be found in TV Land repeats. But Lucky B’s and Battaglia are each the real deal. 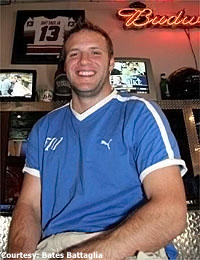 The sports bar, which sits across the street from Battaglia’s condominium complex, is co-owned by Battaglia’s buddy, Mike Lombardo, and run by Battaglia’s father, Richard. The lively tavern, which was voted 2006's Reader’s Choice for Best Overall Bar in Social Magazine, has been a popular Glenwood South District staple since opening three years ago. Most players would pack up their belongings and start fresh in a new city after being traded, but when Battaglia was traded from the Hurricanes to Colorado in 2003, that was not the case. The bar stayed a big part of his life. And now, despite being five years removed from his playing days in Raleigh, the 31-year-old Battaglia still calls Raleigh home. Battaglia has certainly made a name for himself since being selected in the sixth round (132nd overall) by Anaheim in the 1994 NHL Entry Draft. In the thick of his second season with the Maple Leafs, and ninth in the NHL, Battaglia doesn’t have the time or energy to run a busy bar. He insists he is a hockey player first, and a businessman second. It’s the main reason his father oversees Lucky B’s and updates Battaglia about once a week. During the hockey season, Battaglia’s absence doesn’t stop the stream of Hurricanes fans from grabbing a drink before or after a Hurricanes game. Battaglia’s presence, it seems, is never far away. Battaglia has established a solid career. He has played 580 NHL games over nine seasons, highlighted by a Carolina’s run to the 2002 Stanley Cup Final. Battaglia scored a career-high 46 points in 82 games and added 14 points in 23 playoff games that season. While Battaglia continues his career with the Maple Leafs, he feels comfortable with his dad, who has owned several Italian restaurants in Chicago and Florida, in charge of Lucky B’s. “When we were younger, me and my brothers used to hang out at the restaurant,” Battaglia said. “He had several places, and we’d always go in there and mess around and do some dishes. We were always too young to be servers or anything, but it was something that was in the family. I thought once I finished playing hockey that I could get into the business and learn the tricks of the trade from my dad, and I guess I started a little early. Toronto Maple Leafs' Bates Battaglia is co-owner of Lucky B’s Around the Corner, a tavern in Raleigh, North Carolina. That hasn’t stopped the ambitious forward from looking at real estate close to Lucky B’s for a possible future business venture. He thinks the bar has given him a small taste of what’s to come when the timing is right. Battaglia’s first-hand business knowledge will come in handy when he opens the doors to his restaurant. Being a self-proclaimed “foodie” may help. The Chicago native plans on having input about the menu. Battaglia’s love of cooking stems from his childhood, when his Scottish mother, Sandra, would cook Italian dishes for her Sicilian husband, and children. She learned from Battaglia’s Italian grandmother. Battaglia cooks for himself these days and sticks to Italian recipes. He enjoys cooking chicken cacciatore, chicken salten boca, and Italian sausage. But don’t expect Battaglia to serve his Maple Leafs’ teammates. For now, he’ll stick to passing the puck.